Up the ante at your next party or event with the Wrecking Ball Extreme, an exciting four player game that lets you feel like a one-man demolition team! Featuring a giant arena with four pedestals for players to stand in, and a massive "wrecking ball" that hangs from the middle of the unit, the goal of this four-player challenge is to knock every other opposing player off their pedestal by swinging the wrecking ball towards them! 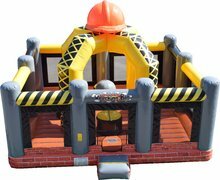 The arena is adorned with a fitting industrial theme, ensuring that the Wrecking Ball Extreme iwill be a total "hit" at your next upcoming party or event!